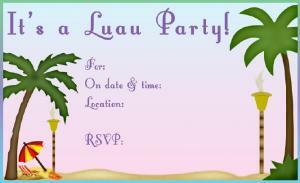 Using printable invitations for your luau party is a quick and easy way to cut expenses while keeping with your theme. 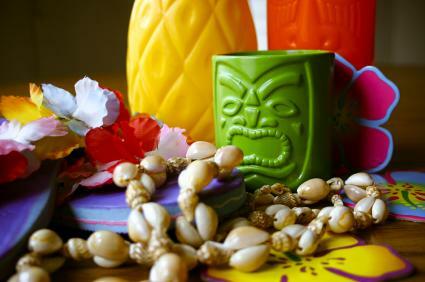 Your luau can be as simple or as elaborate as you choose, but a successful luau takes planning. You'll want to start with some eye-catching invitations that will entice your guests to come to your party. Luaus are all about having fun and spending time with friends and family. This type of celebration requires some planning and expense. 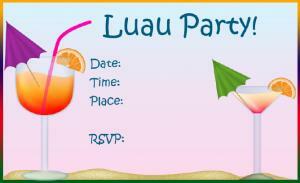 Download a fun luau invitation of your choice and fill in the appropriate celebration information. This can be the easiest and most affordable way to invite guests to your luau party without spending a lot of money. It also gives you the option to add whatever details you like from the convenience of your home. You can download the free printable invitations below by clicking on the image to the right. If you need help downloading the printables, check out these helpful tips. Hawaiian Luau Party offers several free luau invitations for you to download and print. Hoover Web Design offers a free beach-themed pool party invitation that would work great for a luau. Quest Experiences features a downloadable e-book, but you also have access to several luau invitations as well. Printable Party Kits offers a free printable invitation that works well for both kids and adults. Party City features luau themed paper that can be used to print your own invitation on. There are quite a few design options available, from florals to flip-flops to tiki statues. Impress In Print sells luau stationary that can be used to print all the details of your upcoming party. The stationary is done in a Hawaiian theme with an orange background and will catch the attention of all your guests. Since the invitation is the first notice guests will receive about your upcoming party, make sure it will be memorable. The invitation should be appealing and make guests want to attend the party. In addition to important details such as location, time and date, the invitation can announce the theme of the party and any special details like what to wear or bring.